This week we held an event as part of Manchester City Council's Hate Crime Awareness Week. This is the third year that Manchester has held such events, giving community groups access to small grants to hold events and activities. We chose to focus on religious hate crime in particular and asked our neighbours at the Menorah Synagogue if they wanted to partner with us. Menorah has a fantastic building and we were thrilled when they offered to host the event. 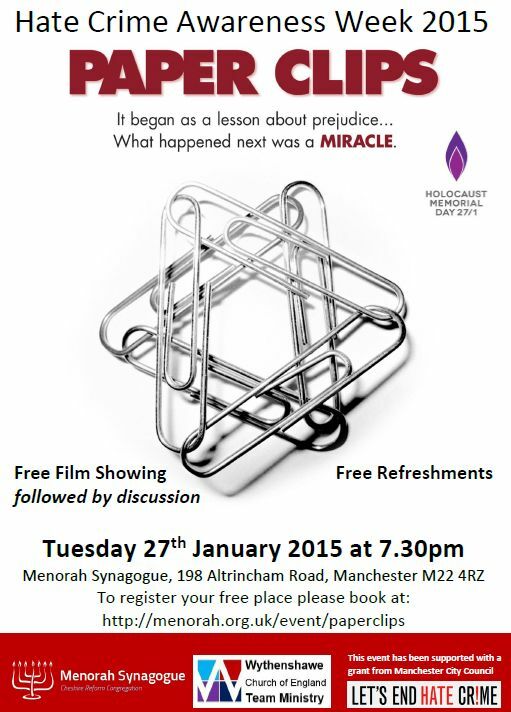 Coinciding with Holocaust Memorial Day we chose to show a film called Paperclips. This follows the amazing journey of a group of school children who couldn't comprehend the figure of 6 million which is the number of Jewish people killed in the Holocaust. They set out to collect a Paperclip for every life. They ended up with 24,000,000 because so many people wanted to contribute. Even bigger was the impact upon their community in terms of learning about the horrific hate crimes that took place and the lessons learned about tolerance and diversity. After the film we heard a few words from Gisela - a holocaust survivor, who spoke movingly and succinctly about the importance of not only remembering what happened but continuing to be accepting of one another. "Is it right to keep reminding children of The Holocaust or should we move on?" "Do faith schools help or hinder?" "How can we challenge others when we hear racist conversations/comments?" "What is the most reported hate crime in Wythenshawe?" "What are the police actually doing about hate crime?" "What are the main aspects of living together well?" We had further comments from the audience including experiences of families in a Benchill who supported Jewish children who came to this city in the 1940's. We also heard of hate crimes taking place in our community where people have been verbally and physically attacked. We realised that as humans we learn to hate and we must stop this so that we learn to love instead. Everyone was given a Paperclip to take away as a reminder of what we had learnt at the event and challenged to tell at least one other person "what we did last night"
If we put the Holocaust behind us we will soon have another Holocaust in front of us. When children in a small rural town in Tennessee began to collect a single paper clip for every person murdered in the Holocaust, they could not have imagined that their project would snowball throughout the world. So many people sent paper clips, often with human stories attached, that, at the last count there were 30 million, now stored in an authentic German transport car as part of the Children’s Holocaust Memorial in Baltimore. The film about the project has been shown around the world and tells how those pupils, from a school without a single Jewish student, have now met Holocaust survivors and how the experience has transformed their lives. A small grant from Manchester City Council has enabled the event to be free of charge.